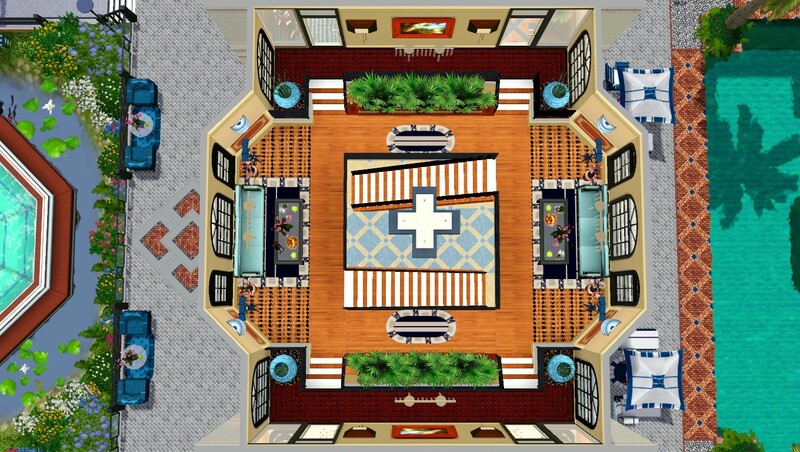 Multipurpose room on the first floor (left wing) for parties, shows, games, family movie nights, etc. 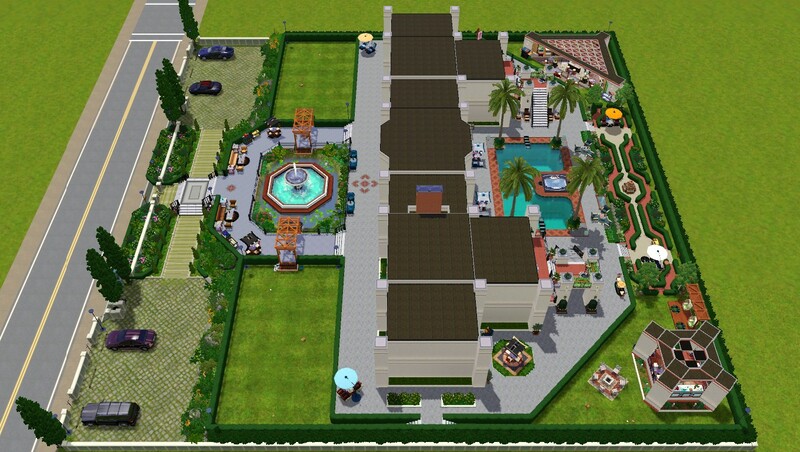 I revisited Mansion Des Larpas and made some interesting changes using basic design styles to upgrade this home. 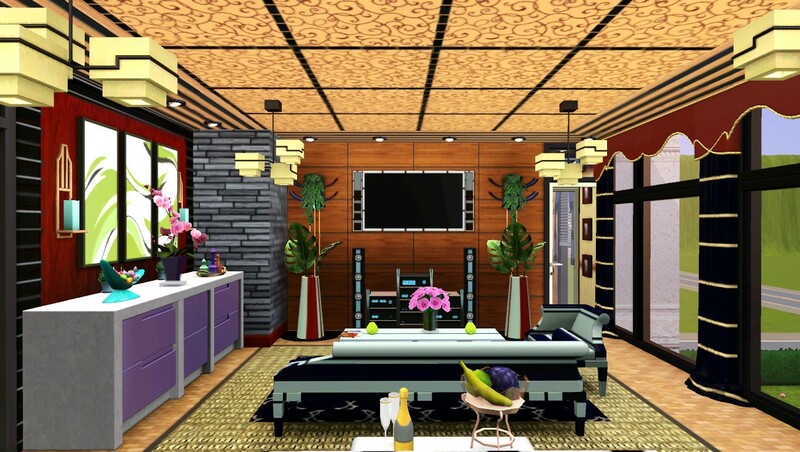 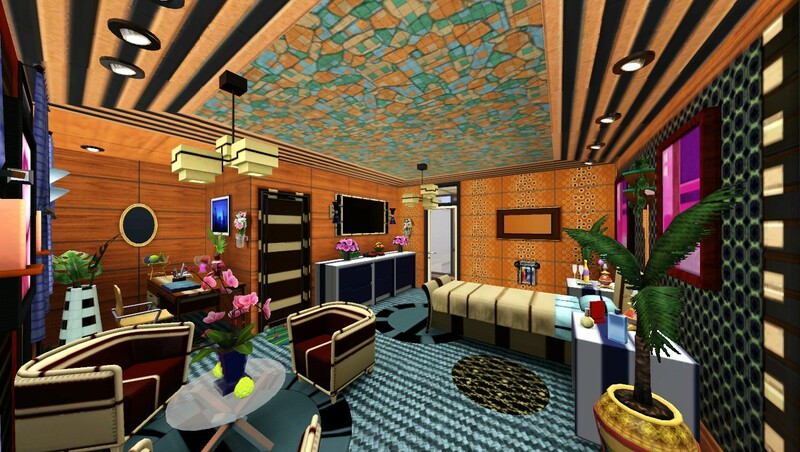 I have two goals set for this lot; first is to create a charming, soothing environment that will put your Sims minds at ease and make them live and feel like celebrities . 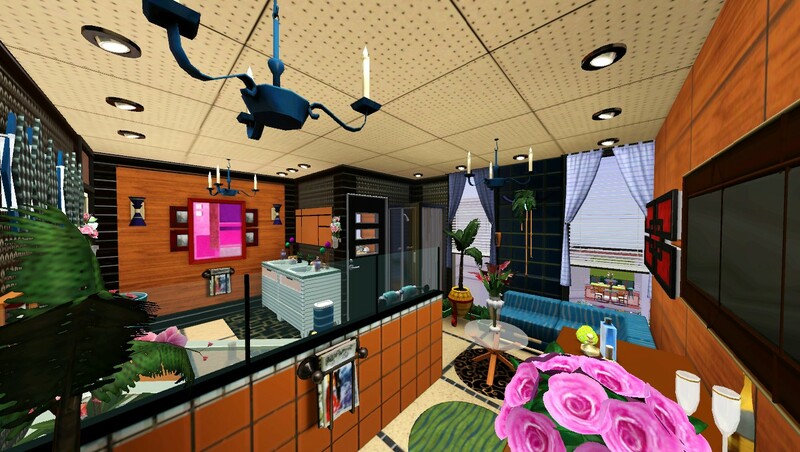 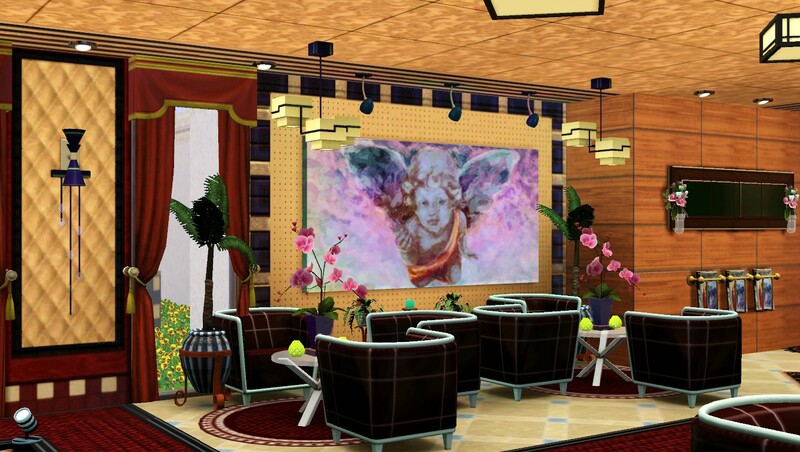 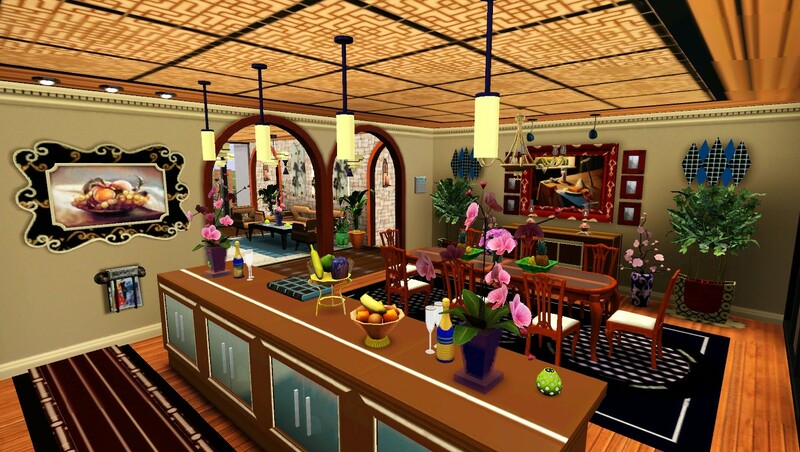 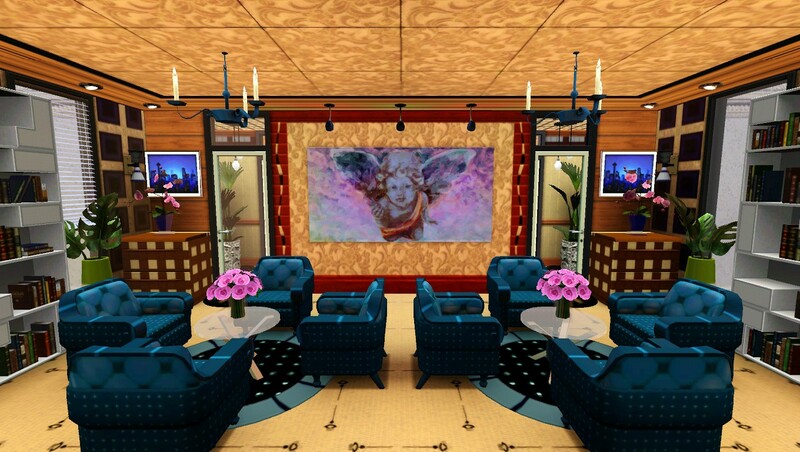 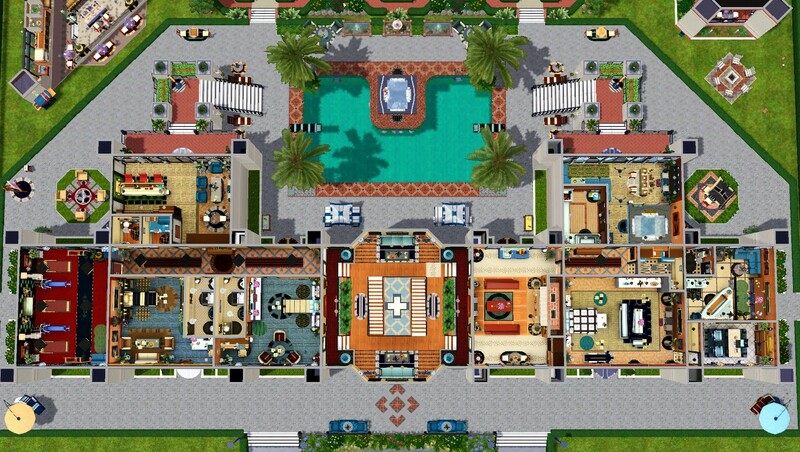 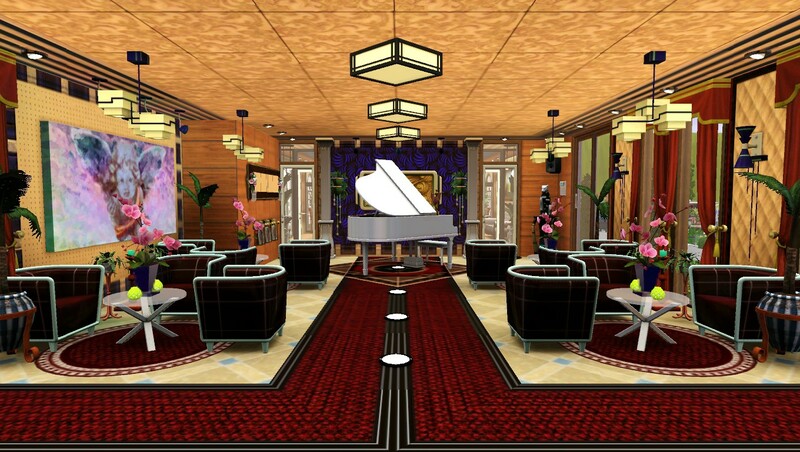 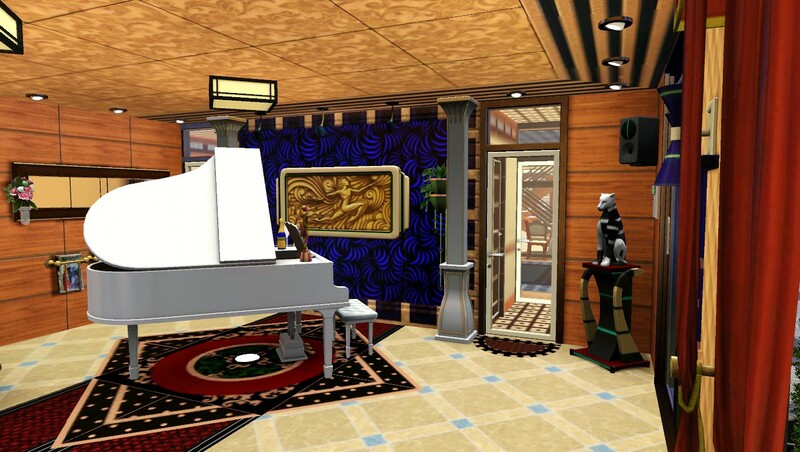 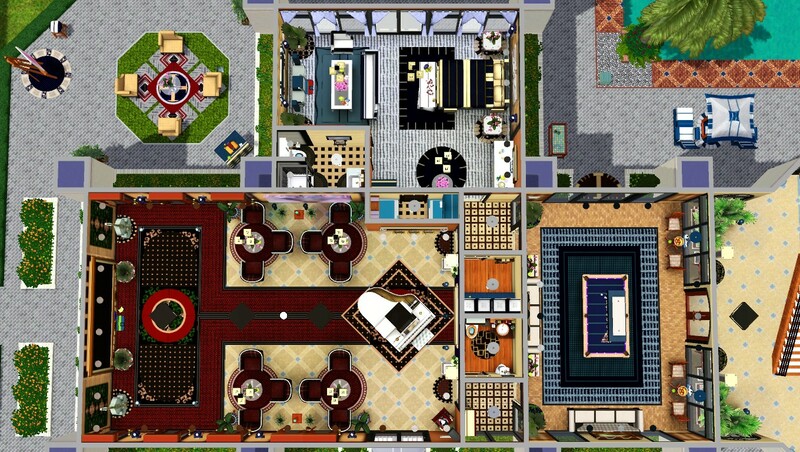 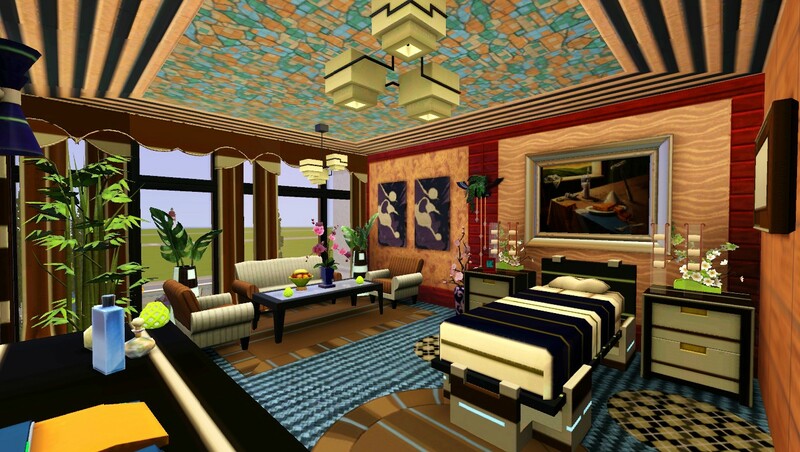 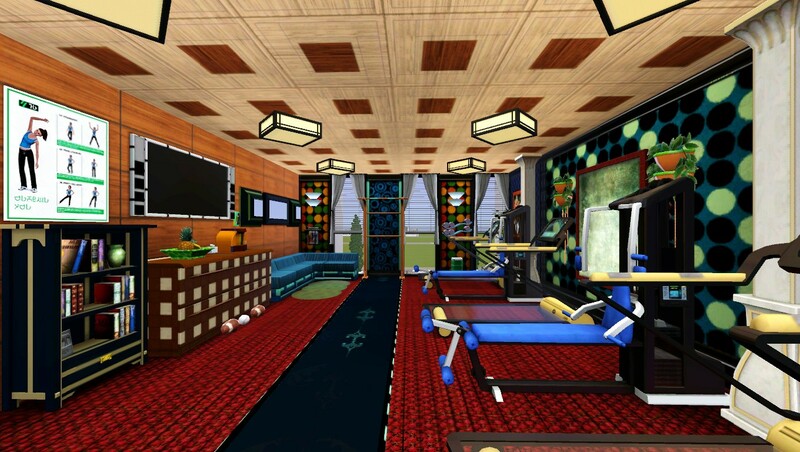 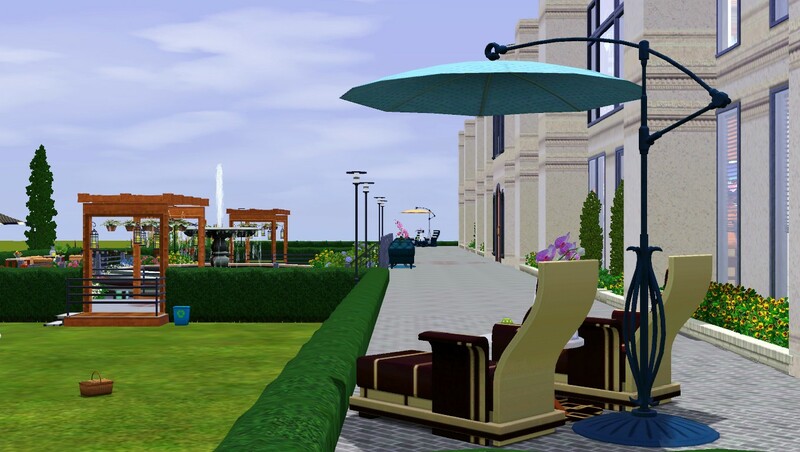 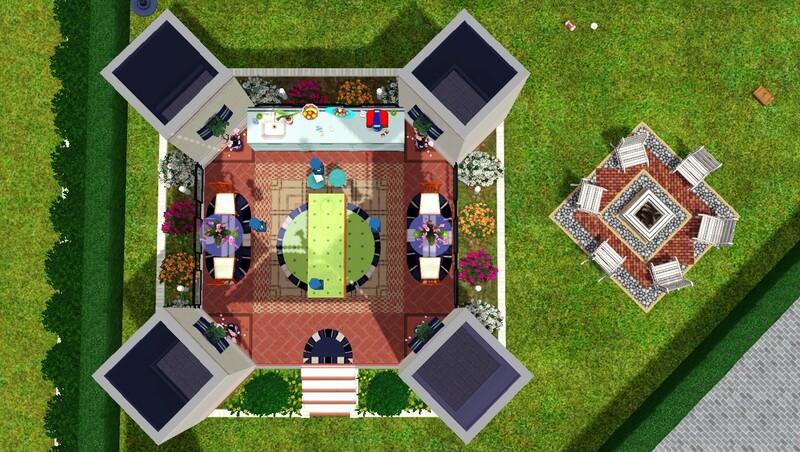 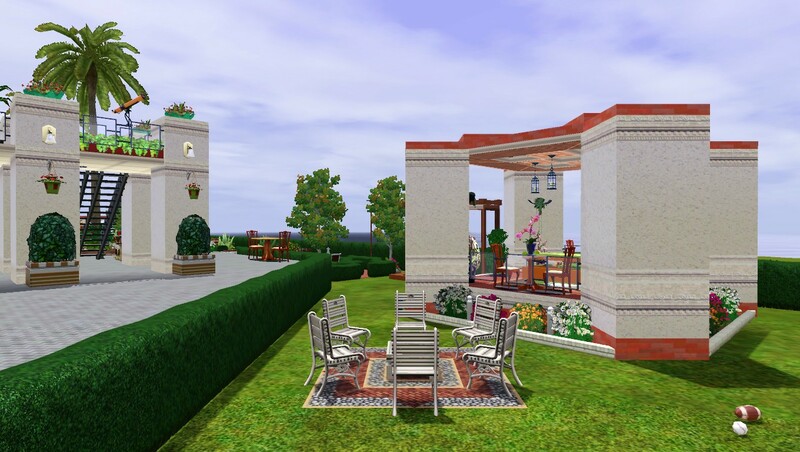 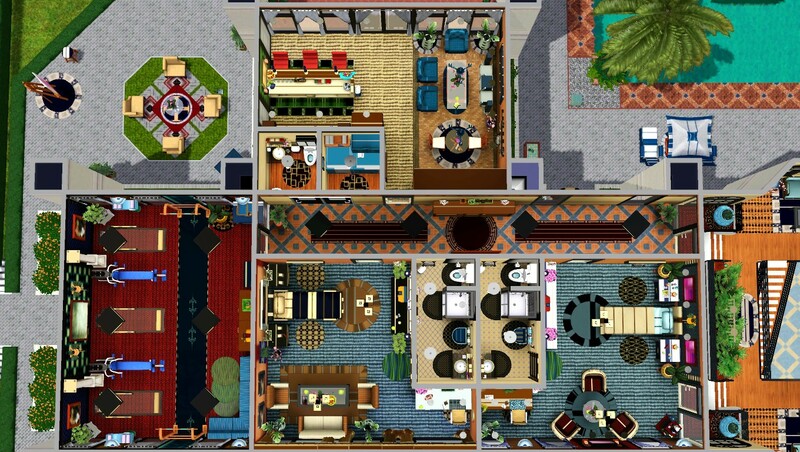 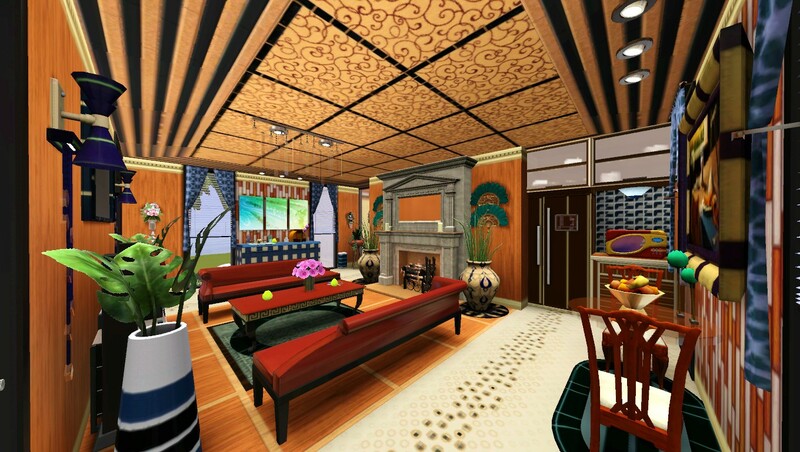 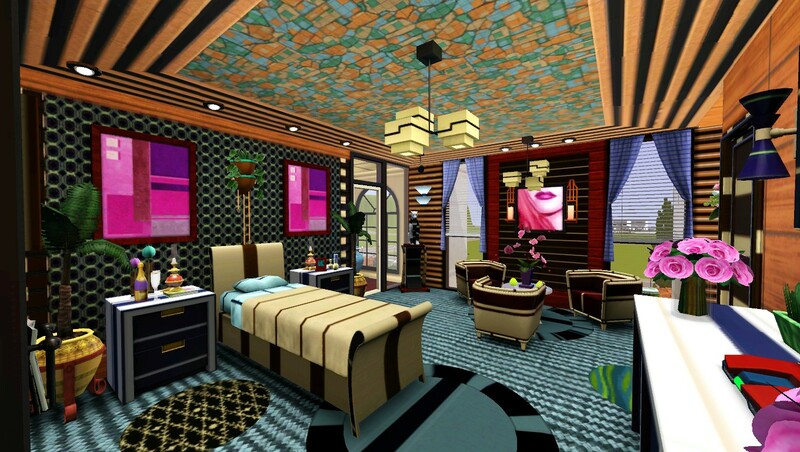 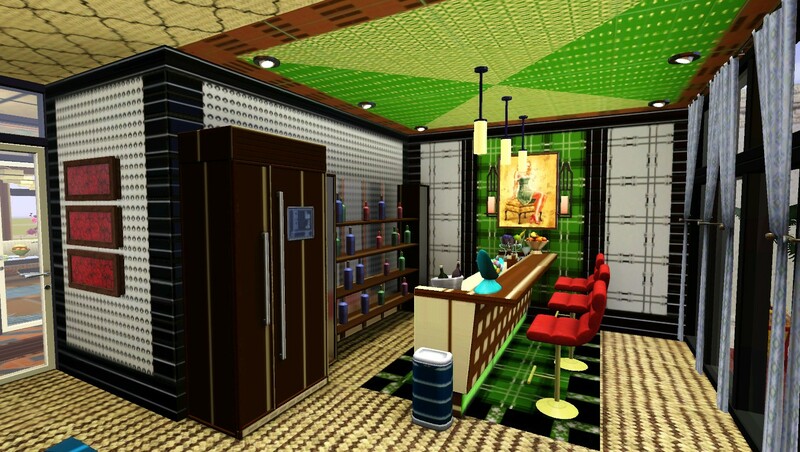 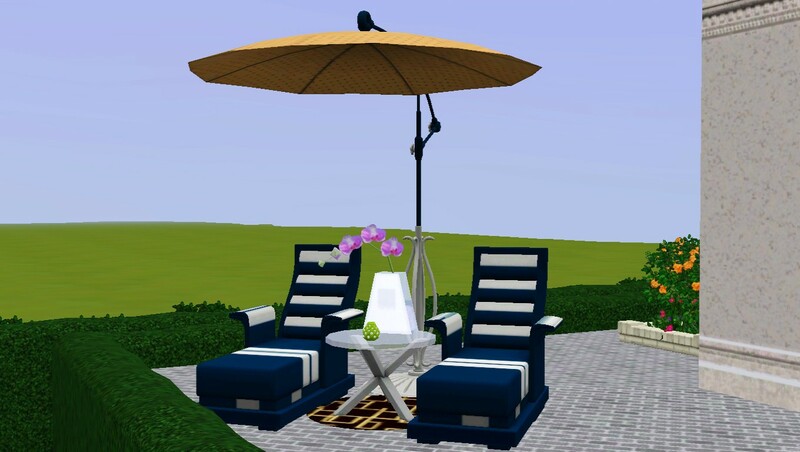 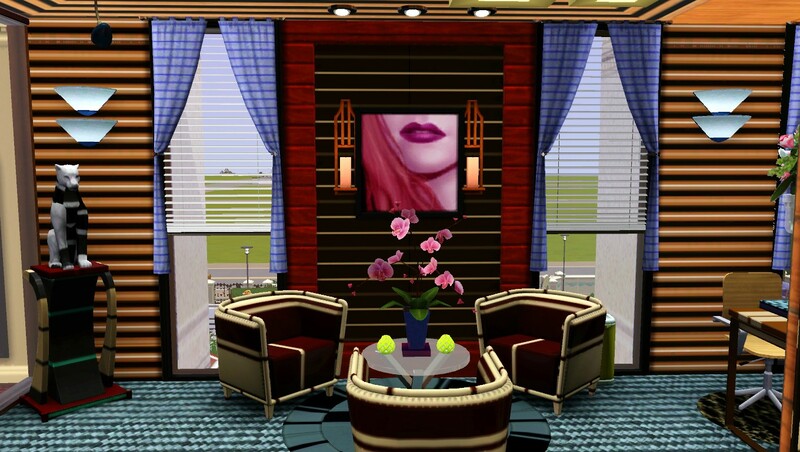 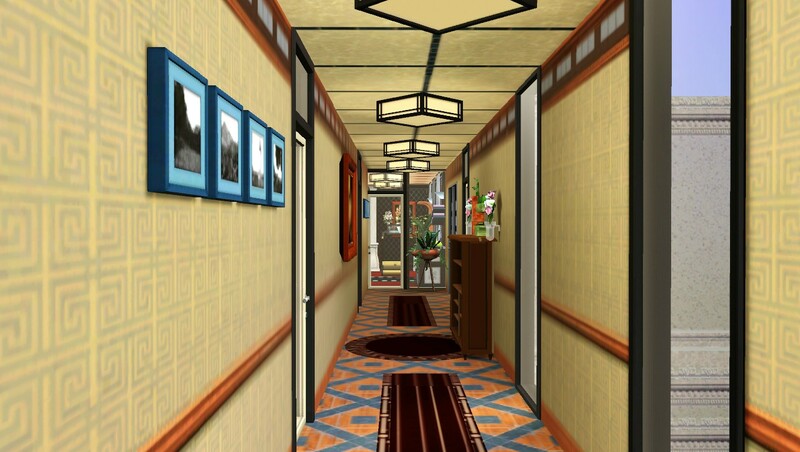 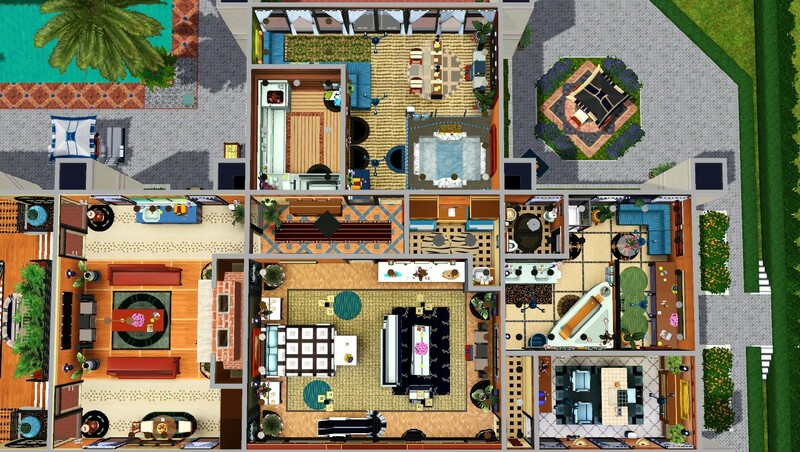 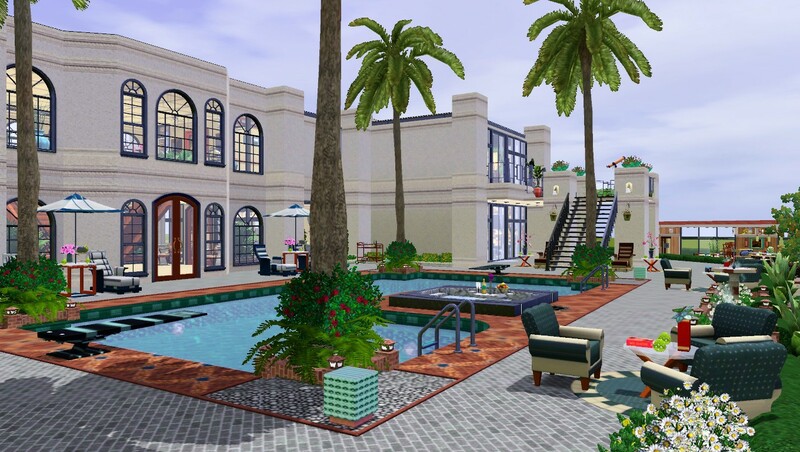 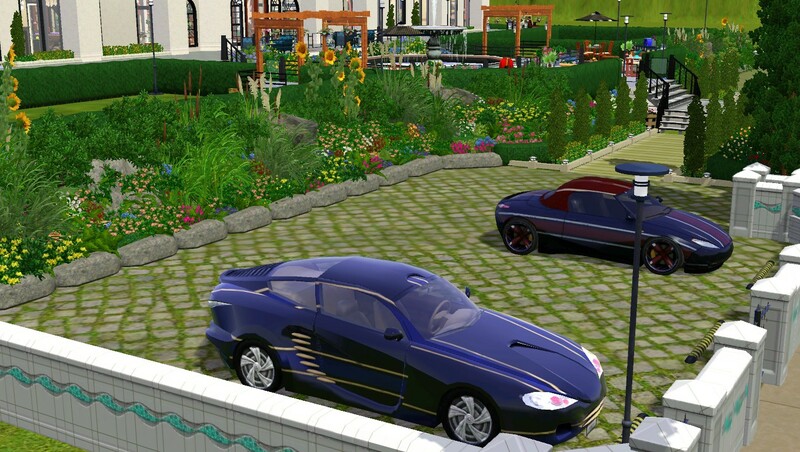 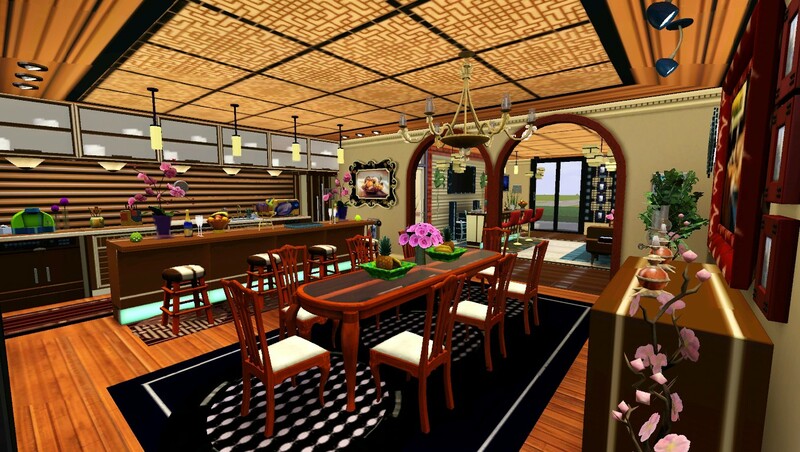 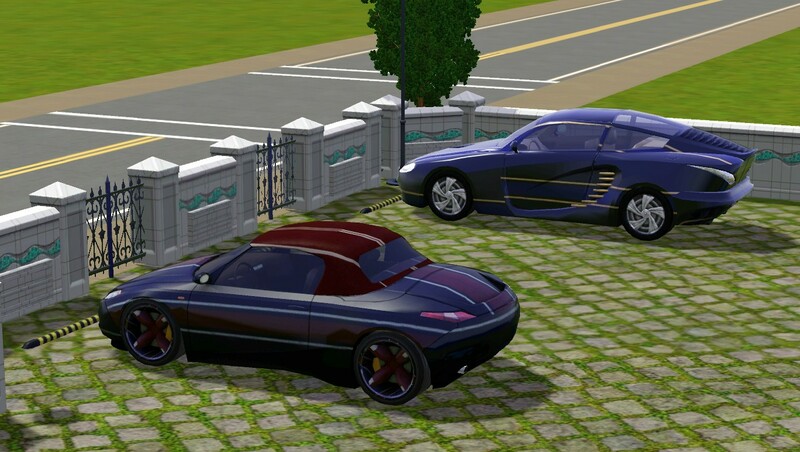 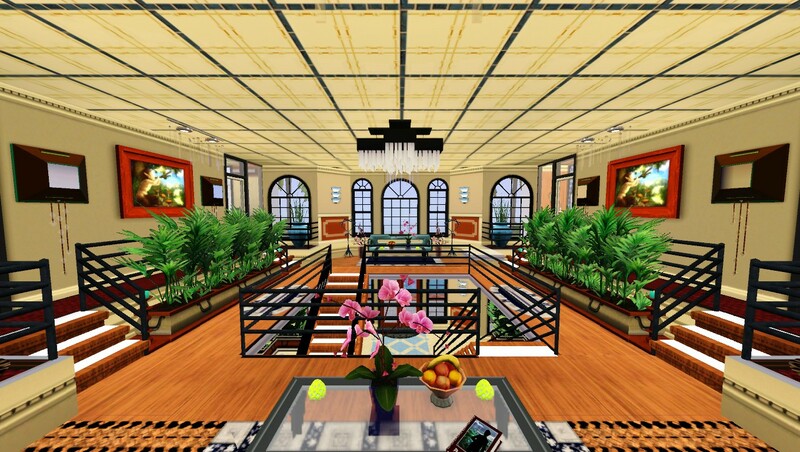 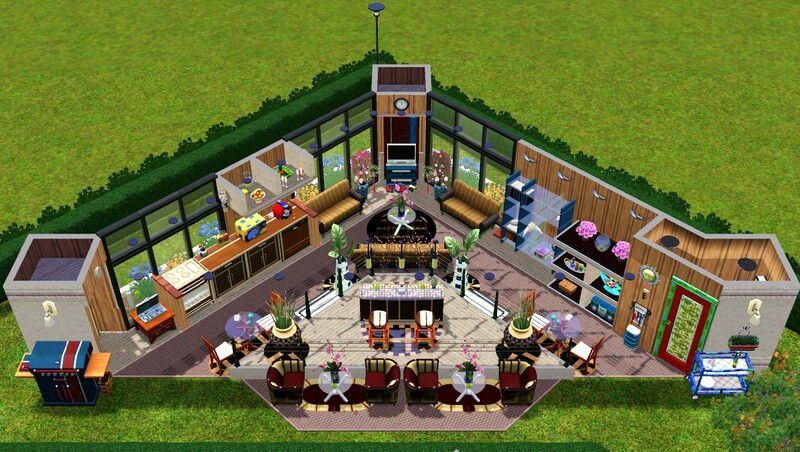 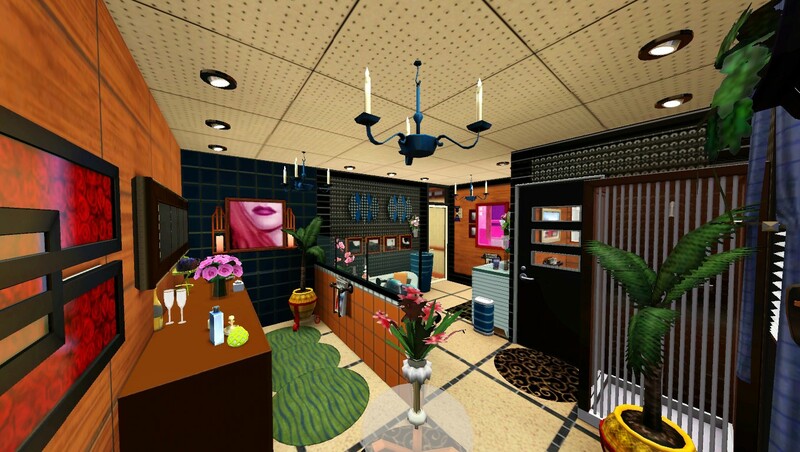 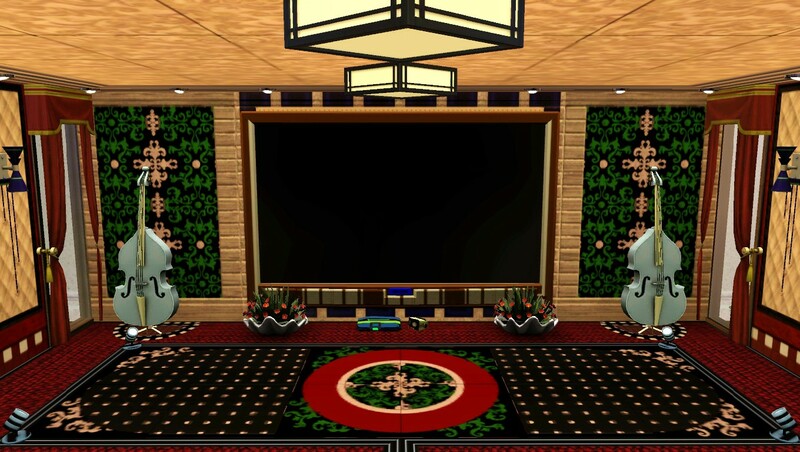 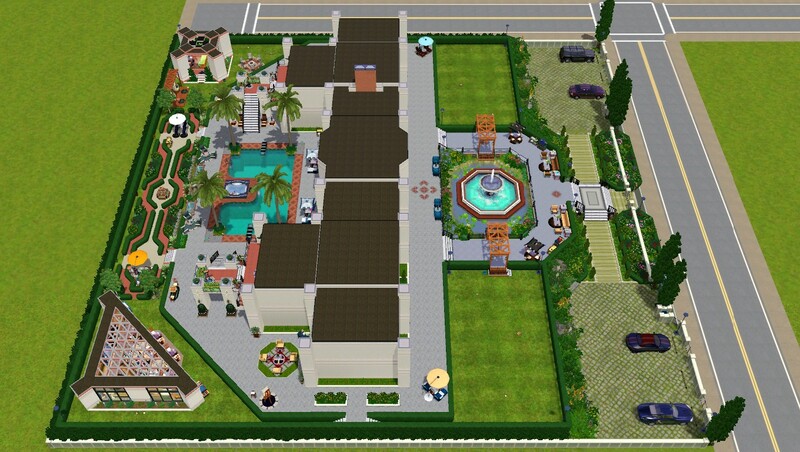 The second is a gift to anyone interested in using the different style options packaged in this lot as a baseline to design their current and/or future homes to best suit their Sims lifestyle. 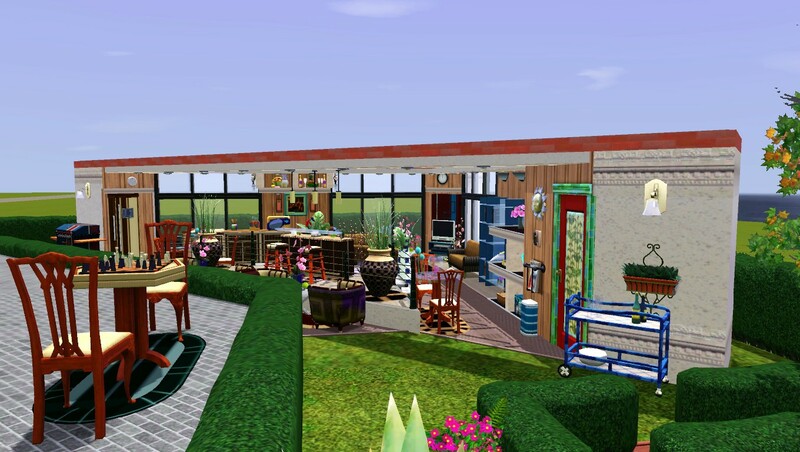 The structure of the house is still the same except for a minor change in the laundry room (2nd floor, right wing) to include a little space (1x1) for the sink. 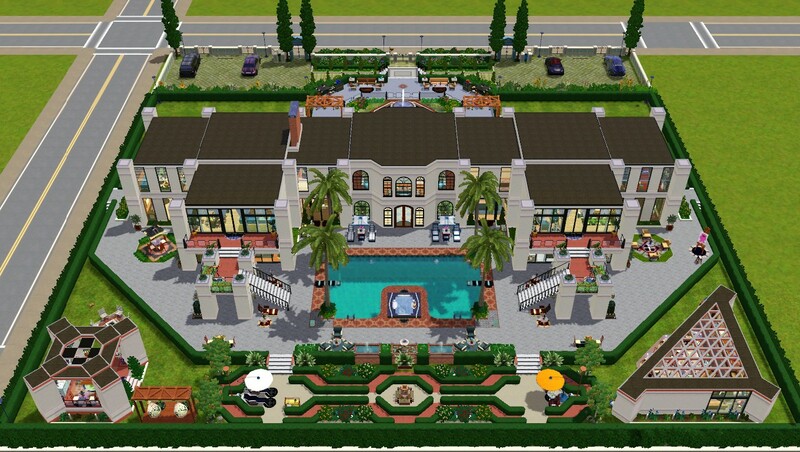 This home is built with a flexible architecture to meet the changing demands of your Sims family needs and thus ideal for a small, medium, or large family. 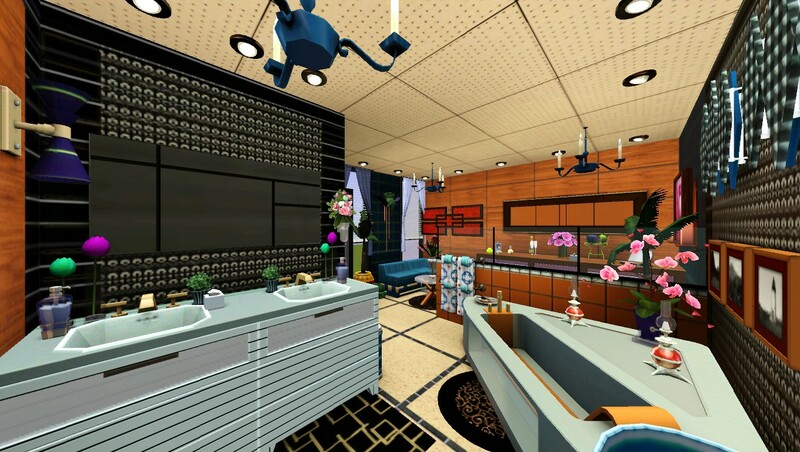 It showcases a mixture of old and modern design styles with a spacious, airy, open-concept kitchen and living areas. 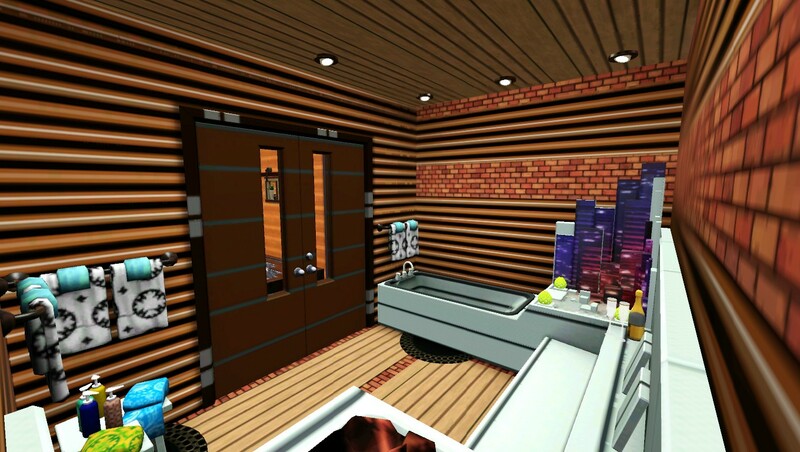 The interior features 4 spacious ensuite bedrooms; a master with private office, guestroom with a private laundry room, and two other bedrooms. 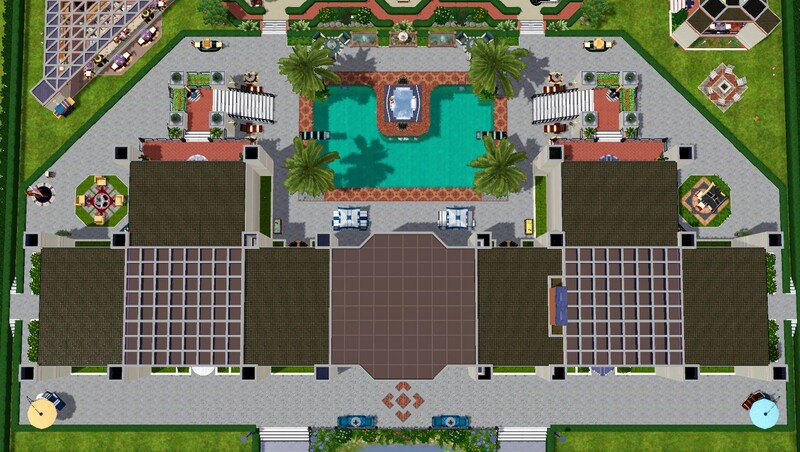 It also offers fully furnished family rooms with kitchens, 2 mini storage rooms (2x2, each with beverage makers/machines), 2 common laundry rooms, 2 balconies, 3 half baths, main library, game room, indoor fireplaces, fitness, sauna, indoor spa hot tub (2nd floor, right wing), and a multipurpose room for parties, shows, etc. 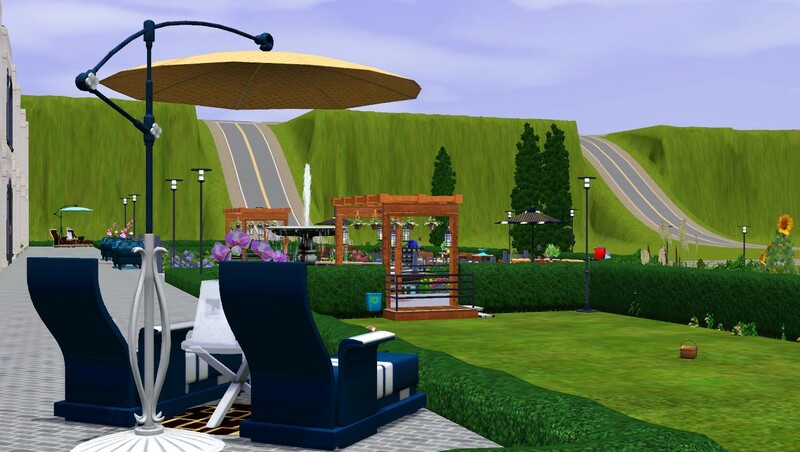 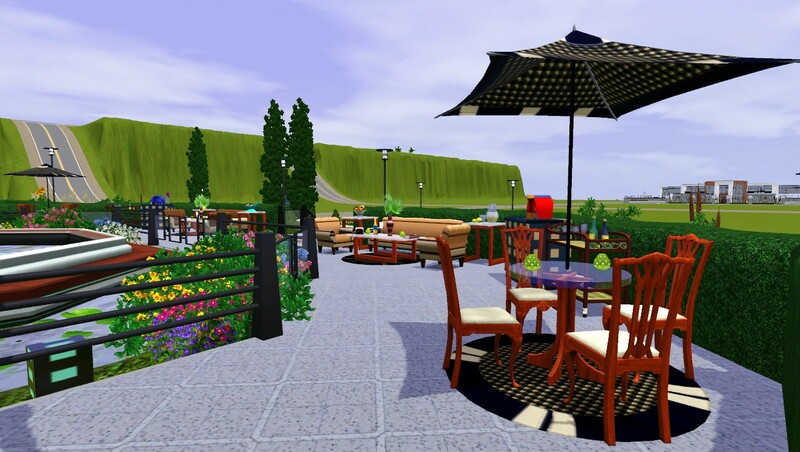 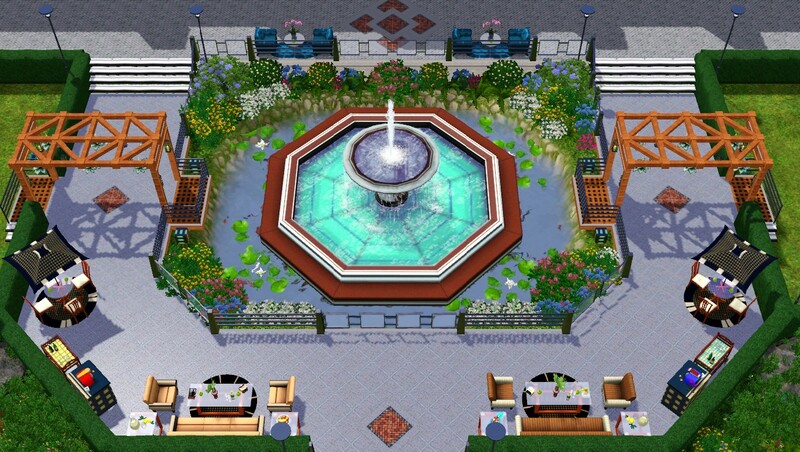 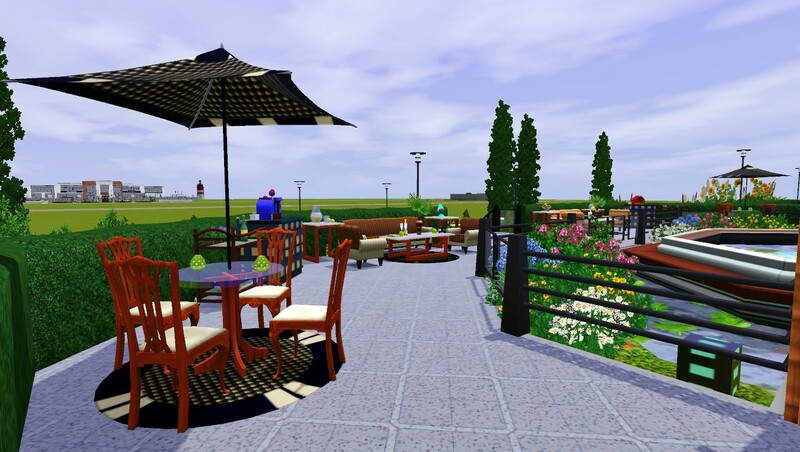 The outdoor environment has a beautiful modified landscape with a charming atmosphere to keep your Sims minds occupied. 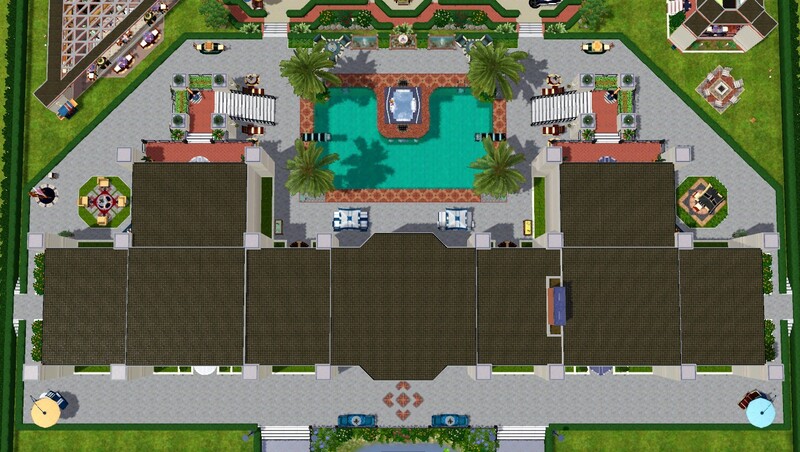 It offers a grill house with kitchen, a swimming pool with built-in hot tub, park, multiple seating/relaxation areas, art and massage corners, outdoor patio fireplace, 2 large spaces in front for recreational activities, 6 car parking spaces, and a fish pond (use the platforms on both sides of the pond for fishing). 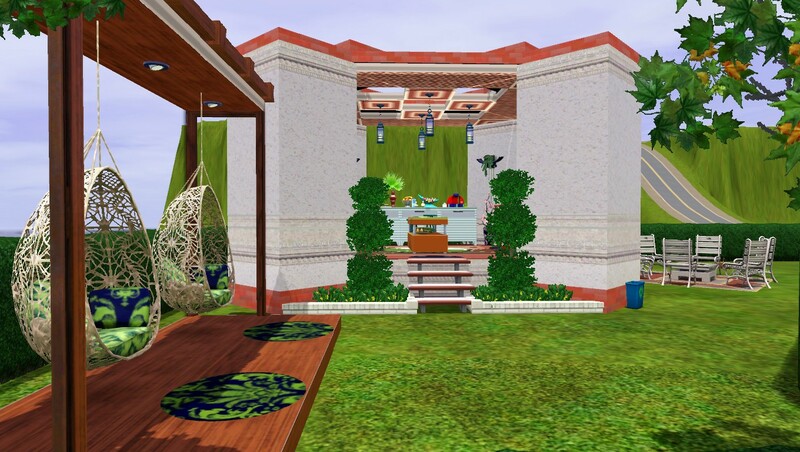 - Redesigned/-decorated wall and floor tiles, furniture, landscape, cars, etc., with new pattern/style combinations. 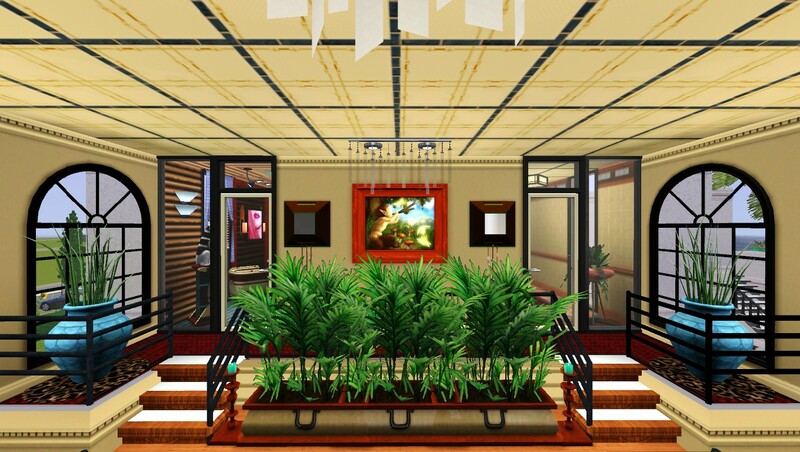 - All rooms, ceiling, and roof tiles are designed to suit their respective environment. 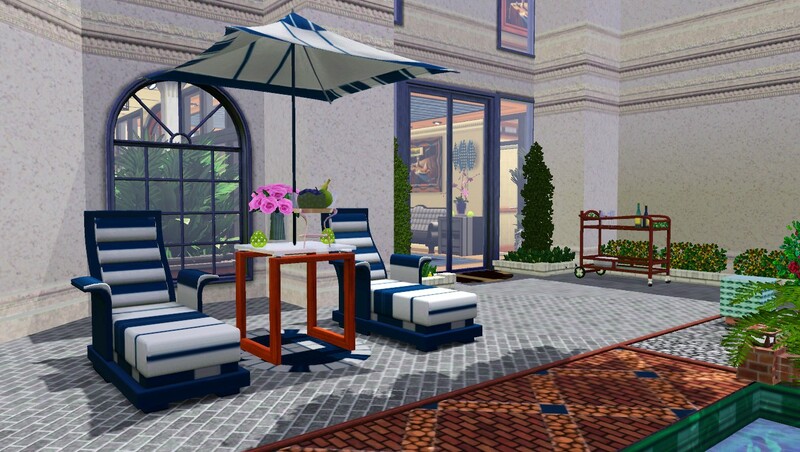 - Added multiple seating/relaxation areas to the front yard and stairs on both sides of the house for easy access. 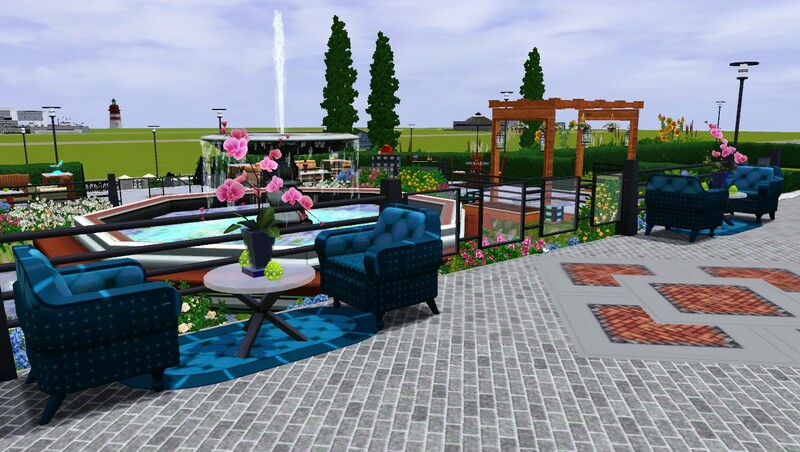 - Replaced the medium Geyser fountains in the front yard with flowers, modified the fence and added more lights, recolored the grass, added new floor tiles, and rocks to make it look natural. 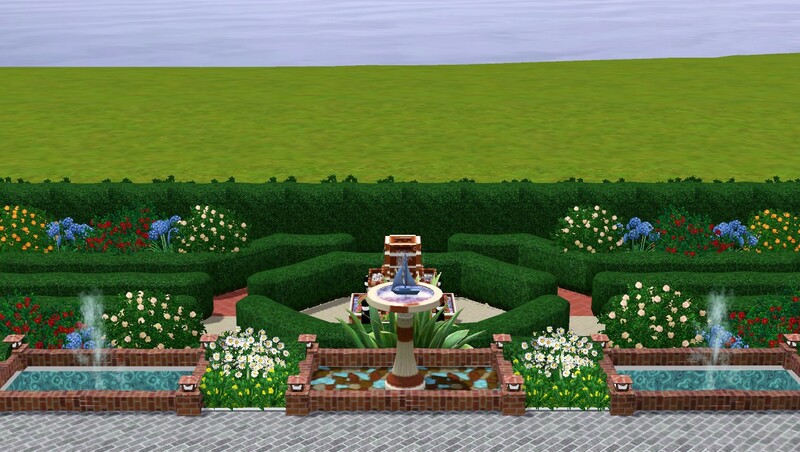 Also created two spaces for garbage cans on both sides of the main gates. 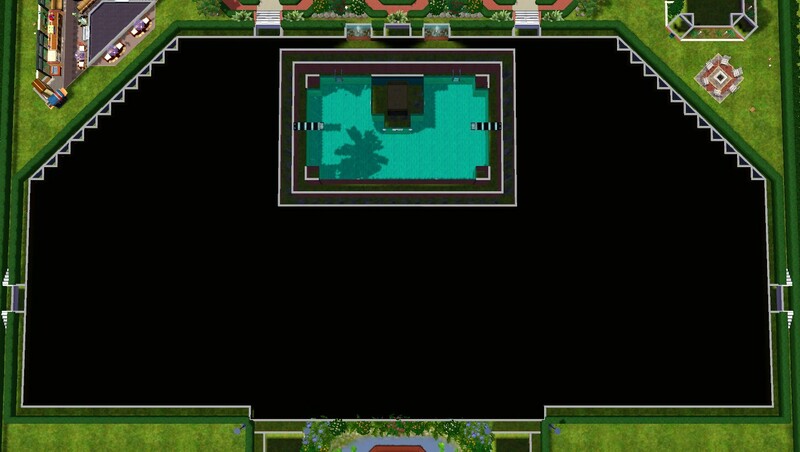 - The backyard comprises a modified pool area with two small Geyser fountains, board games, outdoor computer and dining areas, a birdbath, swimming pool, more seating/relaxation areas, and an outdoor patio fireplace. 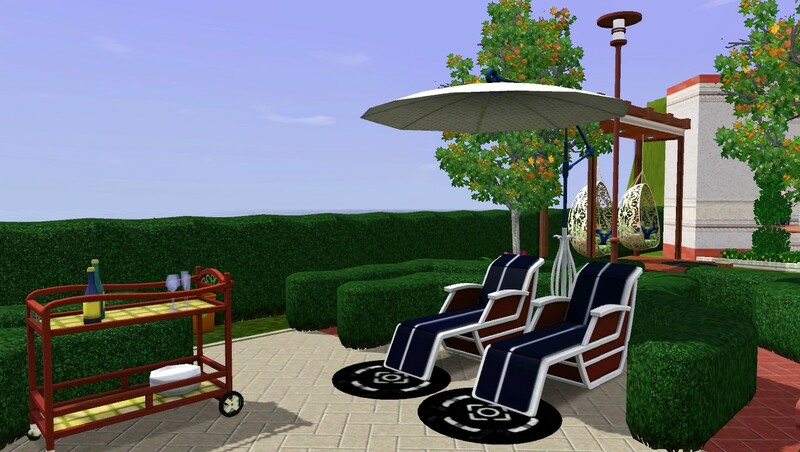 - Moved the board games in the game room to the backyard and replaced them with dining chairs. 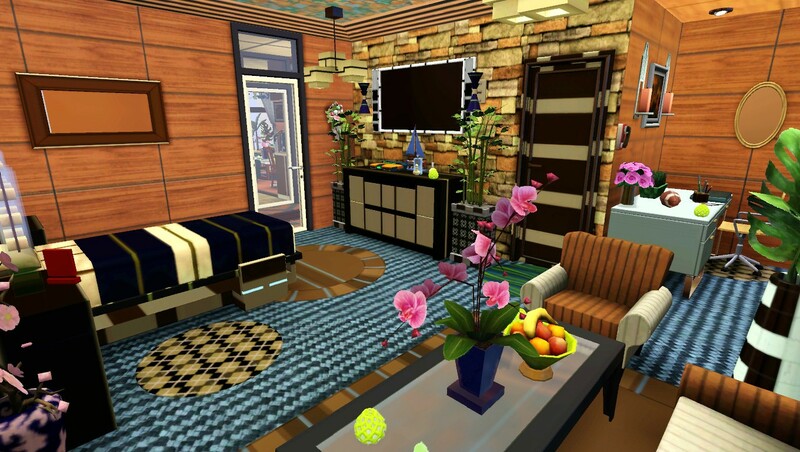 - Redecorated the body massage area to look cozy and inviting. 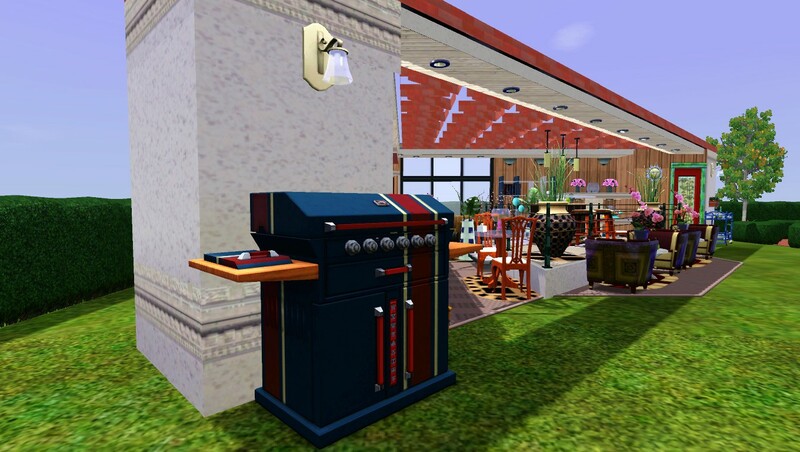 - The grill house remains multilayered due to the built-in shelves but fully functional. 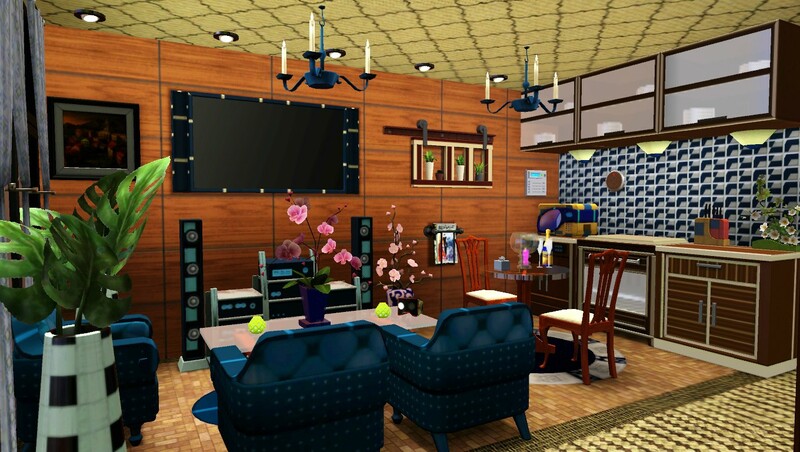 It now includes a standard mini kitchen, more seating/dining areas, and a book shelf to keep your Sims entertained. 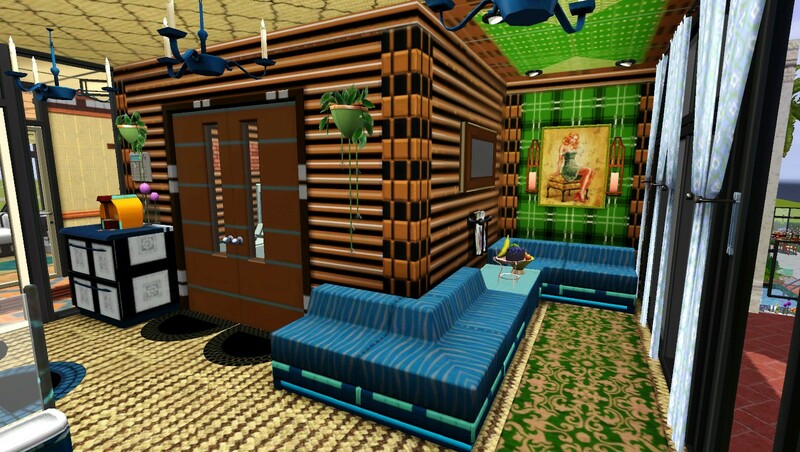 Useable items placed on the floor of the built-in shelves are functional. 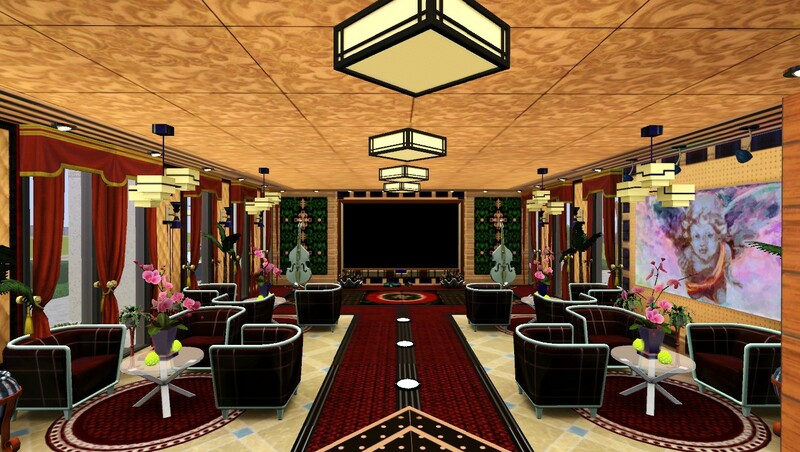 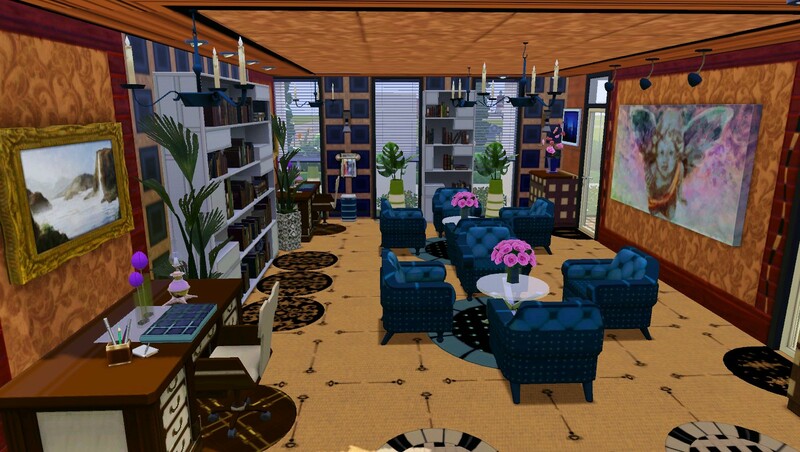 - The library is placed on the first floor to allow more space for seating and decor items. 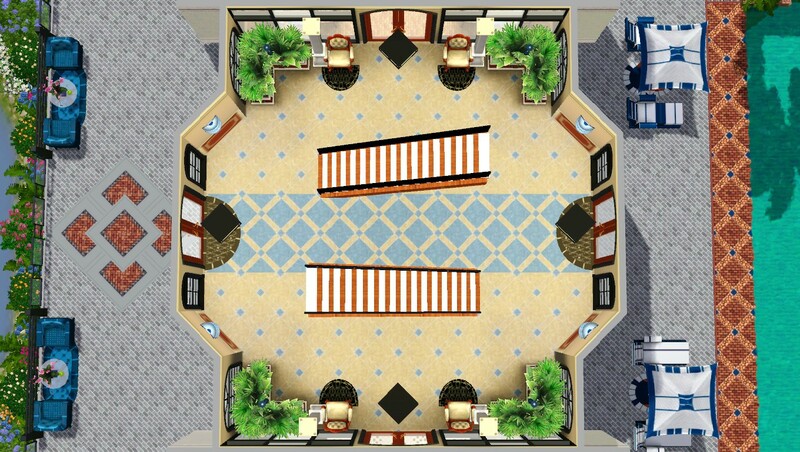 - The multipurpose room is also placed on the first floor but without a platform this time. 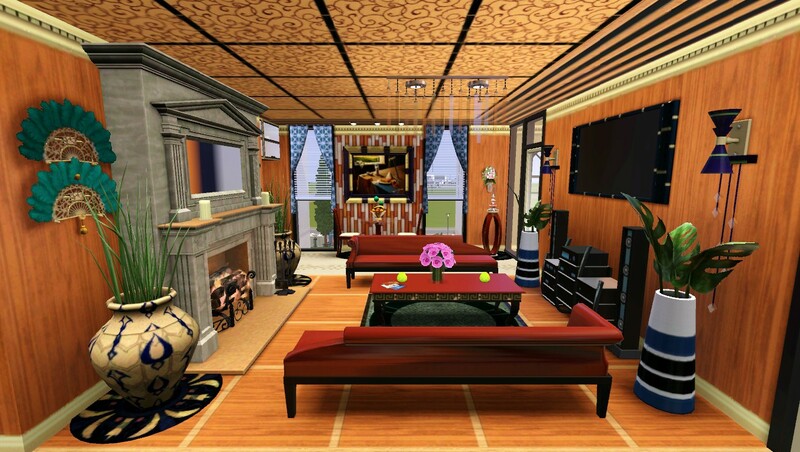 It provides a much larger space for movement and your Sims could watch TV or play video games when not performing on a flat stage. 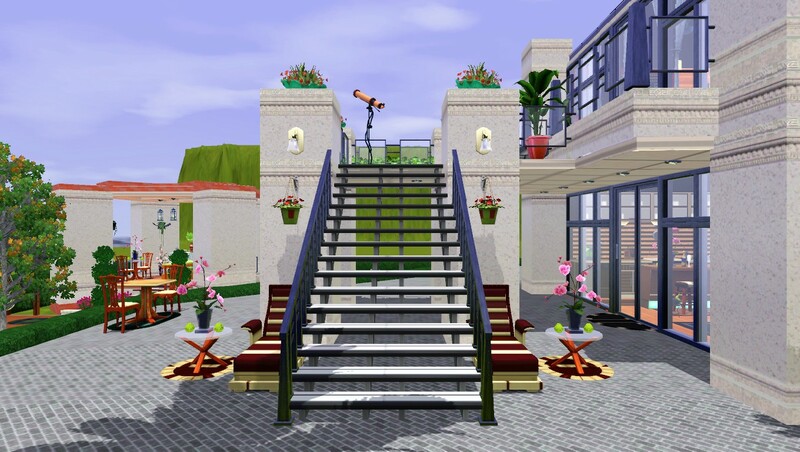 - Added burglar alarms for the uninvited. 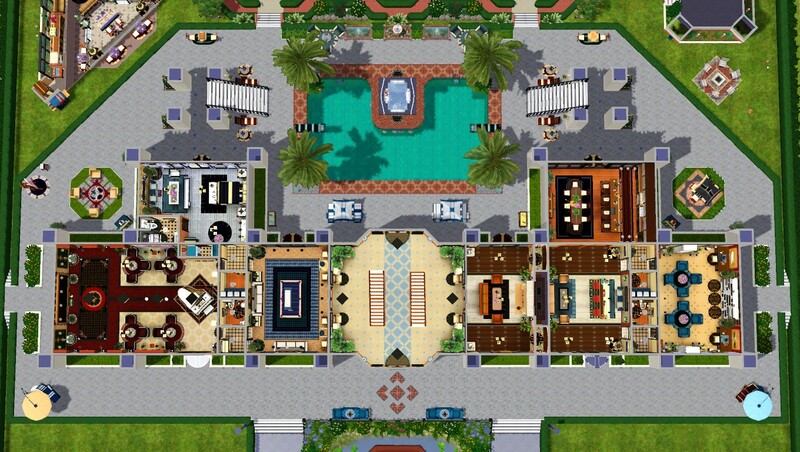 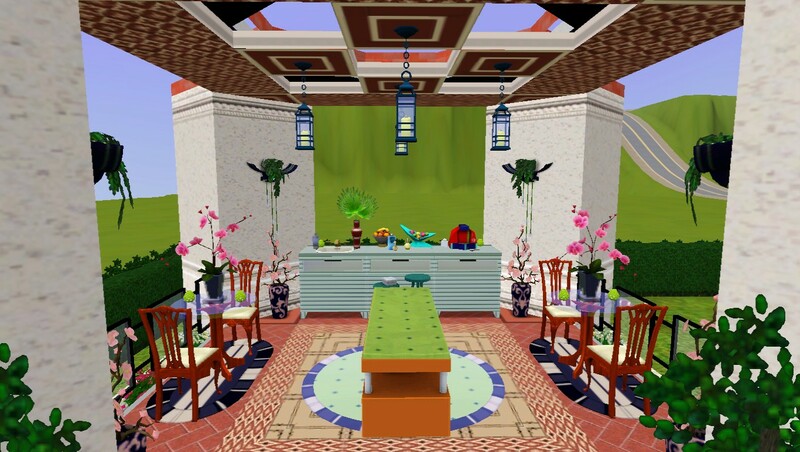 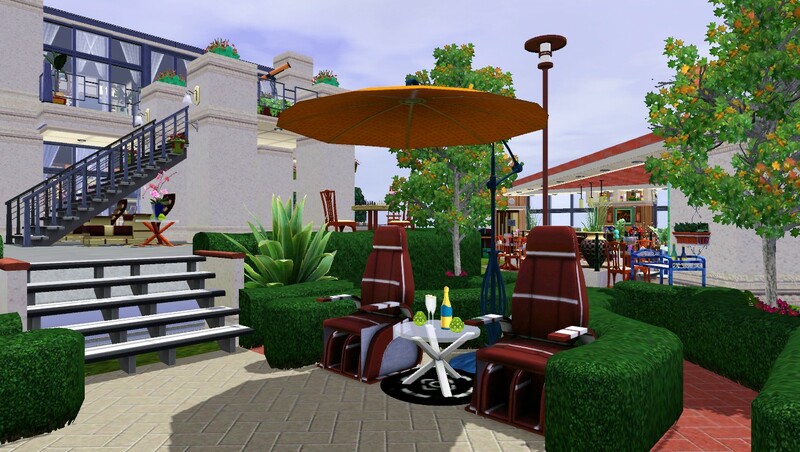 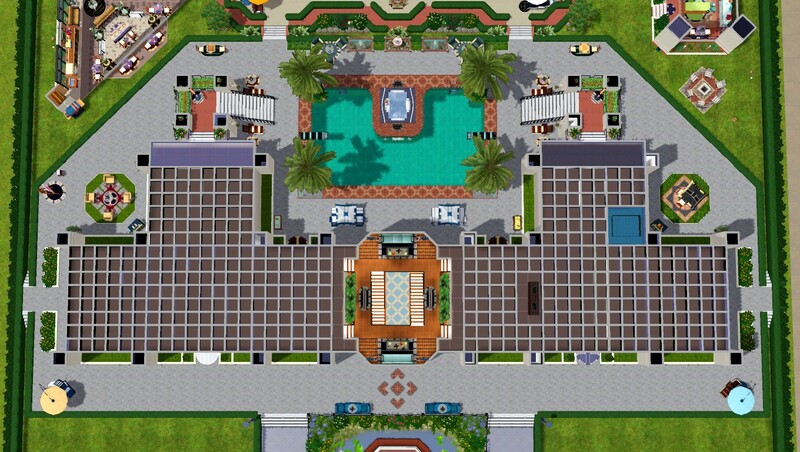 Please note: your Sims might refuse to sit at the dinning chair next to the Spanish Colonial Arch in the main dining room (1st floor, right wing) or at dining tables placed directly outside the grill house. 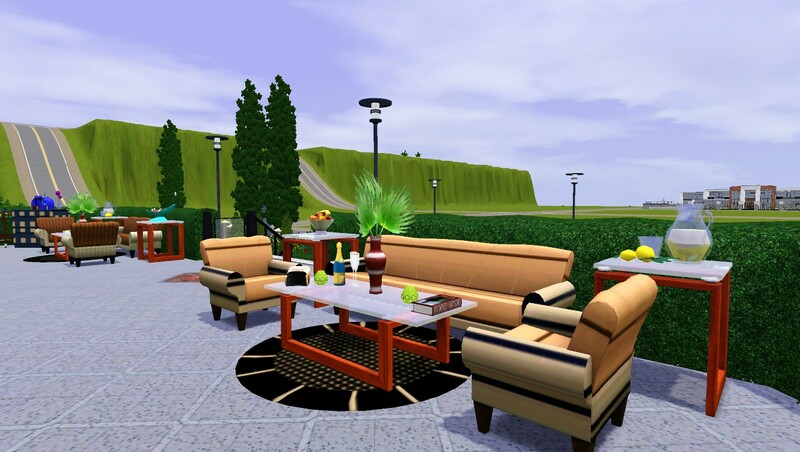 They will sit on chairs without dining tables (weird) so I used club chairs instead. 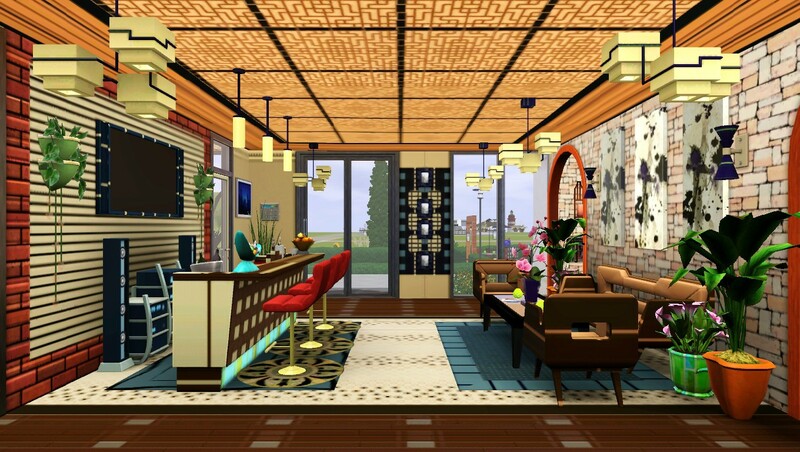 There are many beautiful patterns/styles in the game and I used as much as this lot could handle to avoid an overkill; explore and you will be amazed. 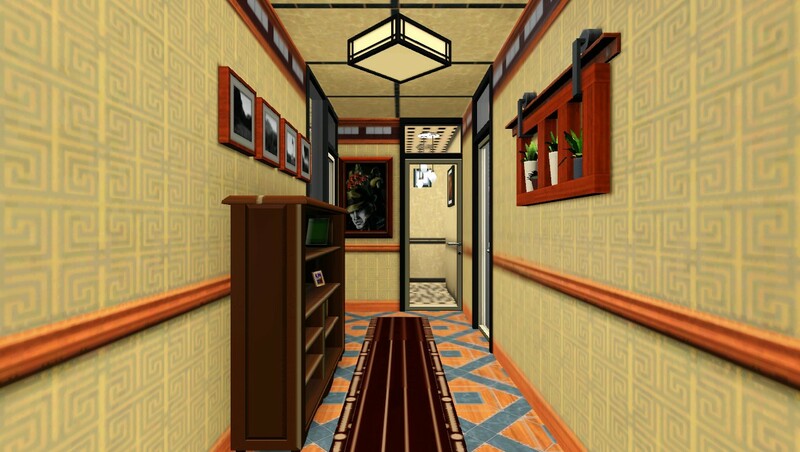 A credit/compliment and a link would be nice if you plan to re-upload my work. 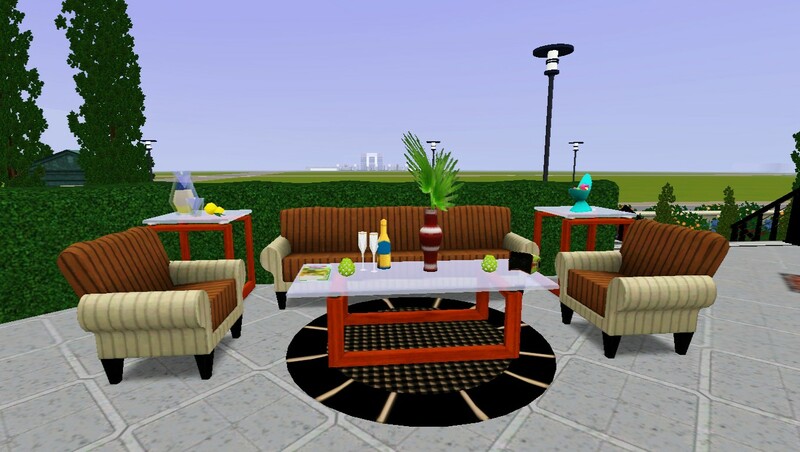 All decorative items are from the base game, Late Night, Showtime, and 4SPs so be sure to have them to make it look exactly the same. 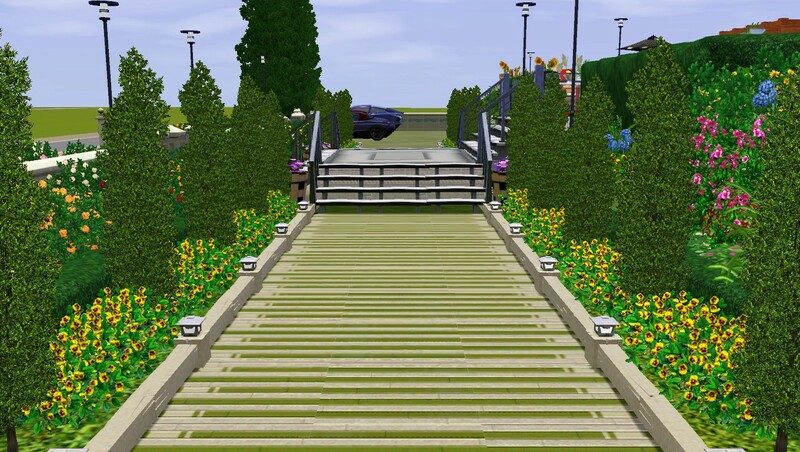 I used medium settings for lighting and shadows, tree and texture details so you might get slightly different looks if your settings are low. 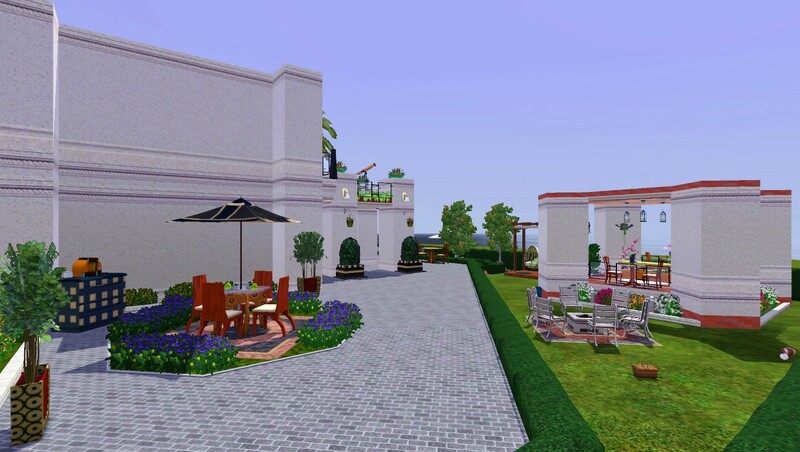 This home is built with cfe and move; place on a flat lot for optimal result. 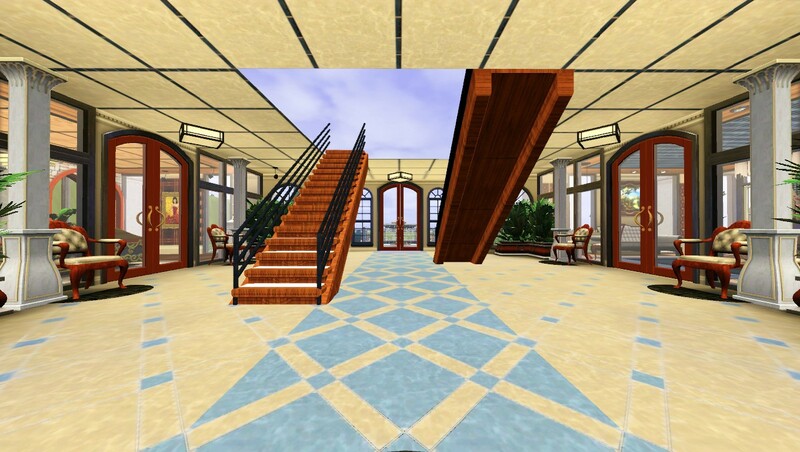 If the floor/ceiling tiles gets mixed up for whatever reason, just run the mouse pointer over them in build mode and you will be fine. 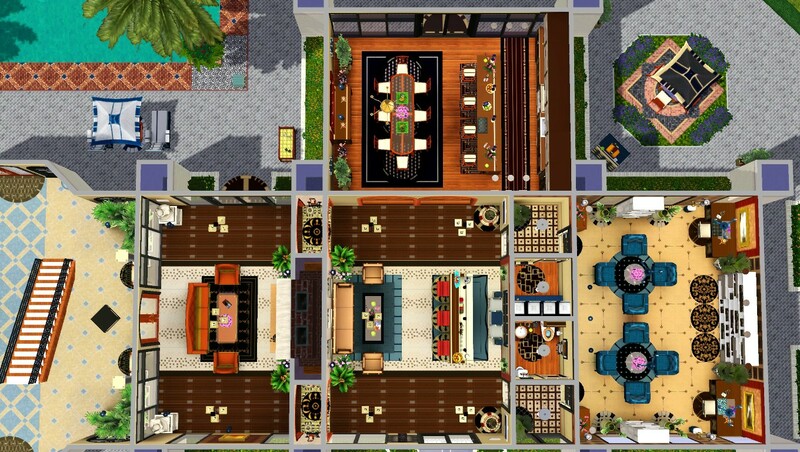 Fully play tested. 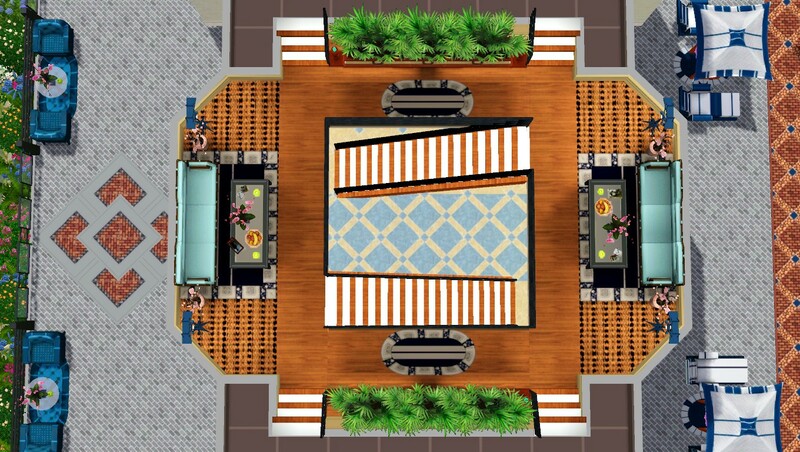 If you encounter any issues or have questions about how to create/use these pattern combinations, I will be glad to help. 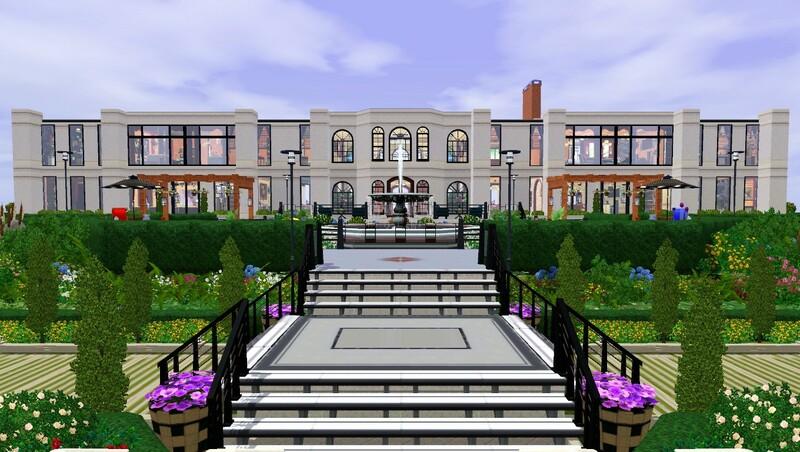 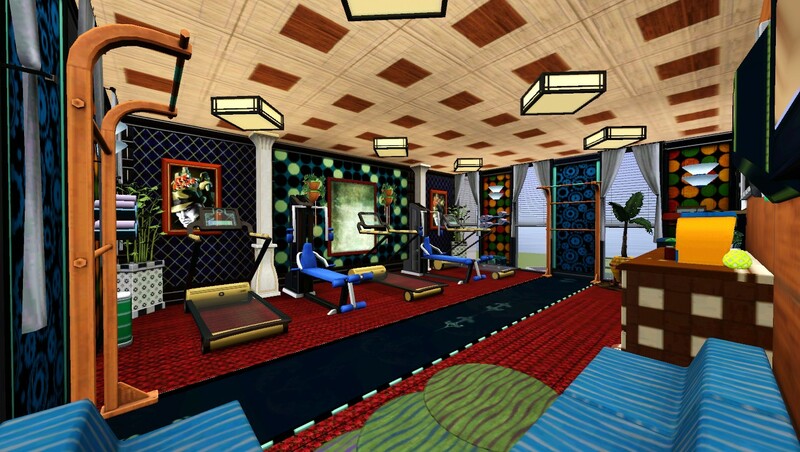 Store contents: If you downloaded my previous mansions with the store contents, you should pretty much have everything.